Today is a super fun day! My friend Shay at Winnie and Walter is celebrating her 4th Birthday! I love Winnie and Walter so much and am so happy to be joining in on today's hop. I stamped the adorable image in rows along the background and then kept them in black and white. I used an ombre ink to add color to the heart and then I popped up the heart from the set From the Bottom of My Heart onto the card front. Super simple! There are prizes! 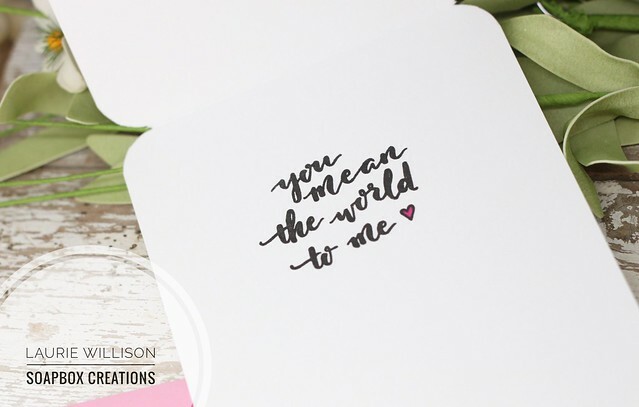 There will be 4 winners picked at random from the entire blog hop which will each receive $40 credit to the Winnie and Walter shop, so don't forget to leave comments along the way. These are such adorable cards! Love them, Laurie! A duo of ultra-sweet cards guaranteed to lift spirits and evoke mega-watt smiles! Crushing over the ellies with their balloon; smitten with the snuggling kitty and puppy! Thank you for the inspiration...shopping list growing! These are both so sweet! Love how the elephant's trunks form a little heart. And those clouds are perfection!! And the purple & green - one of my fave color combos. Love these cards. I like how you repeated stamping the image and left it uncolored. Great idea. Love your cards! Those baby elephants are so cute, and I love the cloud background you did! Thanks for sharing with us! The sweet little critters are so adorable on your cards. Lovely sky background, too!! These are super cute, Laurie!! Love them! Thank you for sharing. Nice cards. Perfection! Your cards make me think I need those stamps. Need! Awww, your cards are so sweet, I really love the first one! Thanks so much for sharing. I love that sweet puppy and kitty card....great projects! Adorable cards! Happy Birthday Winnie & Walter! I love the outline black and white with the colored heart, so so beautiful. Thank you sharing. Oh My Gosh! These are the cutest, sweetest cards! I am in LOVE with this stamp set! Adorable card with these cute animals. These are both super cute Laurie! The scene you've created on the first one is so sweet and I like the coloring of the heart on your second! Great cards - simple designs that are so cute! Adorable cards! Love those sweet elephants and the cute pup and kitty! Pretty coloring! Those elephants are adorable and so sweet! What a great stamp set! Both of your cards are adorable! I especially like how you stamped the background on your second card and left it uncolored. It looks so nice with the ombré heart! Aww.. both the cards are so adorable.. Both of these cards are super sweet! Love the elephants holding the balloon together, but the second card with the black & white background is definitely my fave of the two. Love your cards, the critters are adorable. Love your CAS design on the first card and your pups on the 2nd card have just stolen my heart! I'm so glad you joined the hop today!!! I think you must be an animal lover. Me too. I like the playful images you used and your CAS format. Adorable cards - love thos critters. Oh, these critters are so cute! Those elephants are adorable! And I like how you kept the background black and white on the second card! Fantastic cards! I love the black and white stamped background. I need to remember to do that more often! Such a nice design! Thanks for the inspiration! Love the cards and the stamps are so cute. Cute! These cards are precious! That big hugs stamp set is just perfect. I love how you kept the first one to the image outside and put the sentiment inside. I also wouldn't have thought these would work well to create a patterned paper, but you proved me wrong! I love how that second card looks. Thanks so much for sharing! The puppy and kitten are just to cute! Cute cards, Laurie! LOVE the background on both cards! Adorable cards! Love the addition of the 3D balloon! Thanks Laurie! Awww!!! They're both totally cute!!! Those elephants making the heart with the balloon so cute! Just love it. And the puppy and kitten repeated stamping to create a background with the heart. WOW! I am going to have to try that! What a great idea! Both of these cards are adorable. I love the Elephant card! It is so festive and the puppy and kitten card just melted my heart! 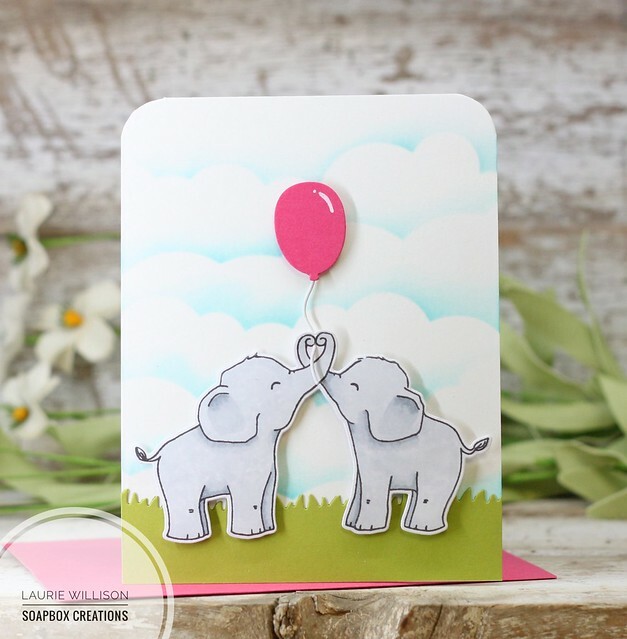 I just love those little pup and kitty images for a background and the sweet elephants with their balloon! Your cards are both so cute ! Such wonderful and cute cards...love the line stamping on the last with the inked heart! Cute cards! Love the second one with the pop of color on the sentiment heart! Love that Big Hugs set! The animals are adorable! These are so adorable. Both fabulous designs. No I totally need to re-create that hearts. That is gorgeous. I love the blending. And those elephants are adorable. I think I need to have all the things. Those critters are so cute. I like how you let them steal the show in your designs. I love animals! Your cards are sooooooooo cute! Your second card really stole my heart! I would love to CASE this one! Awesome technique! These cards are really cute! I love that pop of pink with the elephants! Really fun and fresh! Super sweet pair of cards! The color combo of that heart is absolutely GORGEOUS!! Love the snuggling pets in the background, too! Your cards are both so cute. I am so in love with the little elephants. Thanks for sharing. Lovely cards and those elephants are adorable. Aww! I adore both of them, who can resist a card with animals cuddling? ?